Shared governance is a process that provides both a structure and an environment that empowers nurses to take an active participatory role in decisions that affect nursing practice. It provides our nurses a mechanism to share input regarding their nursing practice by moving decisions closer to the point of care, which increases and formalizes our nursing staff’s participation. At Maury Regional Medical Center, the principles of shared governance are implemented through a variety of nursing councils. By-laws or charters define the structure and operation of these councils, which include processes for communication to nursing personnel. A professional practice model is a schematic that symbolizes our beliefs, values, theories and systems for nursing practice. 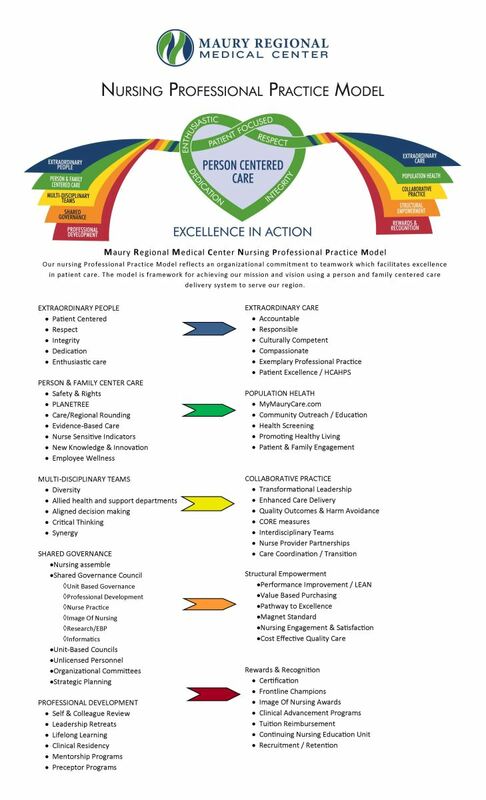 The Maury Regional Medical Center (MRMC) Model for Nursing Professional Practice is our unique depiction of all the key components of nursing practice at MRMC. It represents nursing practice in every setting: inpatient, outpatient and perioperative. The MRMC Nursing Professional Practice model reflects an organizational commitment to teamwork, which facilitates excellence in patient care. By reviewing the model graphic, the RN can begin to identify elements in the model that are a part of the hospital’s vision and values. The center of the model shows the hospital’s focus on person-centered care. This validates nursing’s commitment in supporting the hospital mission of serving our region with world class care (Excellence in Action). Each of the colored ribbons on the right and left side illustrate structures, processes and outcomes used in the delivery of care. The professional practice model was designed and developed by direct care RN staff members to serve as the framework for professional nursing practice and the delivery of patient care at Maury Regional Medical Center.